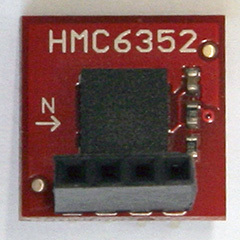 The HMC6352 is an I2C digital compass without tilt compensation. This makes it cheap - you can buy a breakout board from SparkFun for $35. The problem is that when you tilt the sensor the results a pretty unpredictable. 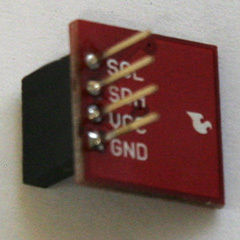 A comparable compass breakout board with tilt compensation (like the HMC6343) costs $150. The HMC6352 is easy to use. Instead or reading from or writing to some addresses or registers it uses 1 character commands. So, for example 'A' is used to read to current heading in 10th's of a degree (a heading of 1345 would be 134.5 degrees). The slave address is 0x42/0x43, which means the Arduino wire address is 0x21. For more information check out the HMC6352 Datasheet . I could not get the Bus Pirate to work, maybe the timing is a little off. The Arduino works just fine. This code does not do anything fancy, it just reads the heading over and over. For a real application it would be better to wake up the module, read the value, and put it back in sleep mode.